Bespoke two tier cake matching any theme, personalised with name & age. View our celebration cake gallery. Birthday cake table set up includes tablecloth, runner & hand made tissue paper tassel garland. X2 Stands of personalised decorated cupcakes and cake pops. View our cupcake gallery for inspiration. X3 Giant round confetti balloons with tulle tails. Elegantly plated decorated biscuits, personalised chocolates & sweet treats. Check out our candy buffets. Large and medium decorative glass jars filled with sweets & treats to match your colour scheme. 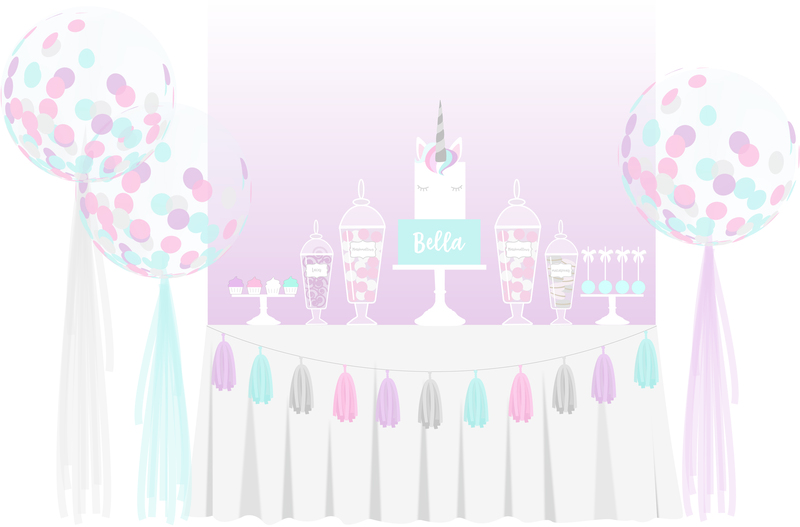 Antonia’s Candy buffets and sweet tables are decorated with personalised labels/tags, ribbon detail and come with sweet scoops and treat bags. Want to add more tiers to your celebration cake? No problem, just contact us and let us know the number of guests and we can recommend a suitable size. Perfect for Christening, Baby showers and 1st birthday cakes. or balloons. From french macarons to cake pops, see our favours menu for ideas.